I Declare The James Norbury Annexe…. Open! How to keep this place warm whilst I work on a paeon to the late, great James Norbury? Thought you might enjoy these lads. Not a Norbury pattern – so far as I’m aware! Although he did get everywhere in the 1950s! Something marvellously camp about them. My husband spotted this first, rummaging in a charity shop, and he wanted it for his avatar online. I’m not sure what that says about him – other than he likes archery and comes from the 1950s… And many years of being married to me might do that to a man. 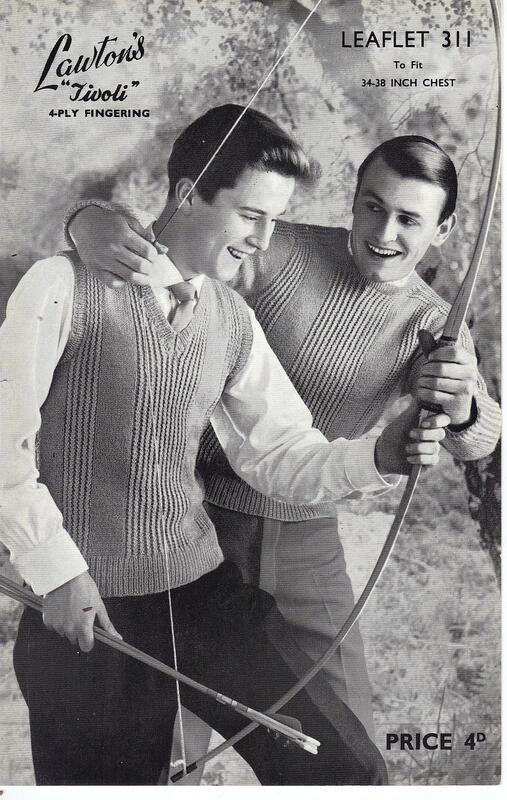 I often think male models in old knitting patterns are doing consciously ‘macho’ things, to dilute the apparent campness of wearing something your mummy/wife knitted for you. Which somehow makes them look even camper. A bit like the film ‘300’. Click to enlarge. You won't regret it! 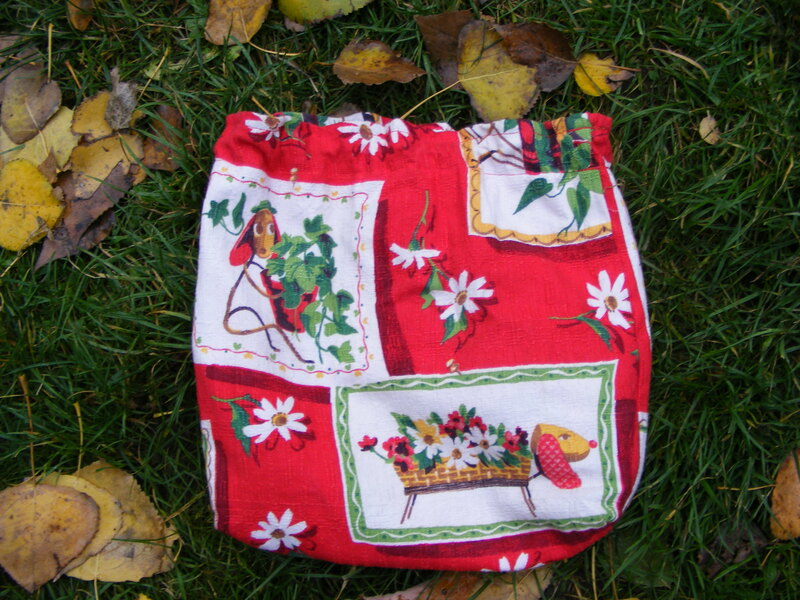 And I once bought the campest knitting bag ever from her Etsy shop which bizarrely featured strange 1950’s sausage dogs inserted into what might be flower arrangements. Stitchy has a new book out, ‘Knitting It Old School’. Which I will review for you soon! Back up to Whitby this weekend. I wanted to take one last look at the stockings, hat and mittens on display at The Captain Cook Memorial Museum, before they return to Gdansk, at the end of this month. I wanted to take a close look (through the display case!) and take some notes, for my research on the history of Yorkshire knitting. The three items on display from the wreck of The General Carleton, are a pair of stockings, an interesting thrummed cap, and a pair of mittens. The mittens were recognisably Latvian (I knew from having spent a frightening amount of the 1980s glued to Shelagh Hollingworth’s ‘Scandinavian Knitting’). The other two items I feel are Yorkshire. I documented everything I could, paying especial interest to the stockings as they seem to be like the ones I was researching being knit by the charity school girls in York, in the 1780s and 90s. Will be sharing that research in the coming months. Also on display, a letter from Capt. Phipps dated 10th May, 1773, listing the clothing requested for a crew of a similar ship to the General Carleton. I should say, ‘Fearnought’ jackets are made from a fulled, woven wool and probably like the one pictured here, from the wreck of the General Carleton. Again, mention of knitted items but no mention of a gansey or anything we could interpret as such. In 1773, Racehorse attempted an expedition to the North Pole, so this is detailing clothing from the most extreme conditions imaginable. Capt. Phipps took both Racehorse and Carcass to esplore the North-West Passage in 1773 – Horatio Nelson was midshipman on the Carcass, and it was on this expedition he had his famous brawl with a polar bear. There’s a vivid account of this voyage here. My blog posts are like buses – nothing for ages then two come at once. This is another pic found on my sons’ machine. 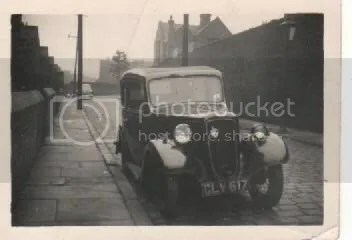 Dad, outside his house, in Leeds, would be early 1930s. This house was technically a ‘back to back’ so it had two addresses. This side of the house I never saw once as everyone came and went the back door way. This side’s address was Vicar’s terrace – but the more-used side was Bankside Street, Harehills, Leeds. Elderly people have told me that when they were young, Harehills was where the ‘rich people’ lived. How times change! By the 1960s this was a ‘slum clearance’ area and at one point the council were threatening to forcibly buy this entire street – so they could knock it down. This house was sold in the mid 1970s – for £150. It had an organ built into the attic by my grandfather – literally built on site. Somehow, even that had been stripped out and stolen when we came to sell the house. In my dad’s childhood, it had been the Jewish area of town. Down the road they had theatrical digs where all the acts playing the Leeds City Varieties, and the Empire etc, would stay. Before it belonged to my grandad it had belonged to his father-in-law, Tom Boothman. The house was built for Tom. 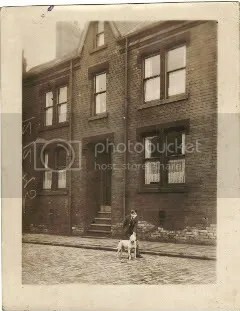 He had come from Shadwell on the outskirts of Leeds, and still owned Bradley terrace (off Roman Ave) and the big house on the left at the very top of Roman Ave (now renamed Birchwood Hill). He also had a 1930’s house built for him on Roman Ave. Although he lived at Bankside St til my great grandmother died. My dad was born in one of the stone cottages at Bradley Terrace which was and remains pretty idyllic-looking – but came here to Bankside St when my grandad took over the dairy business from his father-in-law, in the 1930s. He was an only child and very happy. My grandad used to say he once saw Houdini do his underwater escape off Leeds Bridge… He also used to say he was friends in later life with one of Houdini’s locksmiths. I’ve often wondered if Houdini stayed at the digs up the road on one of his several visits to Leeds. More recently, I’ve wondered about Houdini’s props. The most famous of his underwater escapes was using a milk churn, after all – and we had a dairy…. I wonder now if my grandad didn’t know Houdini’s mysterious locksmith, via his father-in-law, Tom Boothman – original owner of the dairy? I think my grandad was led to believe that the padlocks were doctored (they weren’t). But I do wonder if he was also visited by someone on Houdini’s tour who’d maybe stayed up the road and spotted the dairy? My grandad would only be a teenager when he saw the Leeds Bridge stunt. But I knew he knew the locksmith in later life and Houdini had an affection for the North of England, returning on tour several times. He did have a mechanic who travelled with him, Jim Collins, and he used a big trunk, Trunk No 8, which contained all manner of equipment to make or repair the special apparatus Houdini used on tour. However, there would have been times when he didn’t have what he need in that trunk, so he would call upon a few selected locksmiths local to the area that he was working to either repair things, or use their workshops. He struck up friendships with these men, and would sometimes visit them when in the area, so it is entirely possible that your grandfather could have known one of these locksmiths. There was one particular handcuff maker in Birmingham that he had a 20 year friendship with, Thomas Frogatt, and it is a fact that he repaired handcuffs for Houdini, and made a “special” set to try to fool him. I have been researching this chap for a while. 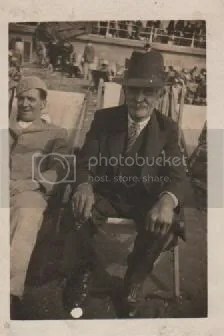 As far as I know, Froggatt did not have any Derbyshire connections, but there would have been others I am sure. In Buxton, Derbyshire, there is a museum, housing a collection of Houdini padlocks etc. I can’t remember the name of the man who the collection belongs to, but he could be the man you mentioned. A call to Buxton Tourist Informantion should put you in touch with the museum. I hope this information is of use to you. It is always very nice to hear from people with a possible Houdini connection. Probably 1914. He was performing at The Empire Theatre there between February 16th to the 21st. Your grandfather would have been 15, so there’s every chance he saw Houdini perform then. Sometimes he would jump in the river shackled, and escape, as publicity for the theatre shows, although what he did at Leeds is not in my records. As you now have the dates, Leeds Local History Department could maybe help. If you find out, please let me know and I’ll include it in my Houdini diary. Next time I get to Leeds – I’m going to try and find out! In the summer of 1833, the Yorkshire and national newspapers were gripped by the story of ‘the Kelfield Prophetess’, a young girl called Hannah Beedham. Hannah described having a vision where she was told her death date. Two thousand people flocked to Kelfield to see her ‘die’. Nine days before her appointment with death, she took to her bed in local gentleman farmer James Sturdy’s farmhouse. She told the world she would die on August 1st, 1833. The world waited. By mid August 1833, the press were calling Hannah ‘The Nine Days’ Wonder’. Here’s her story. One for the historians and genealogists, today! If you’ve heard of Johanna Southcott, you might be interested in Hannah’s story. Whilst my machine has gone all explody, I’m on my sons’ machine and have found some old files from our website. I’d love to share this story with you. This is an updated one, as since writing the original, I met the lovely Chris Cade, who co-wrote the definitive book on Hannah, and Chris put me right on a few things. Hannah was called ‘the Prophetess of Kelfield’ – and one of my ancestors features in the story in a way that is kind of embarrassing, as you’ll see. LIVING all but the final two years of her life before civil registration, there is only a limited amount of bare facts we can reconstruct, regarding Hannah Beedham. There is only one monograph on the life of Hannah Beedham, “Strange Infatuation, The Curious Tale of Hannah Beedham: Forgotten Prophetess of York and Kelfield”, by J.E. Muldowney and C. A. Cade, (self published), 1989, written when a group of Kelfielders including actor Chris Cade, put on a play (in original locations) re. Hannah’s life. In the book, they speculated that members of their audience could even feasibly be descendants of the characters in the story, but at the time of writing, they had no knowledge of any White, Beedham or Sturdys nearby. It is quite amazing when you think, that the tiny village of Kelfield hit the national newspaper headlines twice in under 6 months – Hannah’s story in the summer of 1833, and the tragedy when 11 church singers drowned, in the December of the same year. Both stories featured the Sturdy family. It’s amazing that no-one made the link between names in the two stories – the victim, school-teacher’s daughter Clara Sturdy and James Sturdy, the Kelfield gardener/farmer who allowed Beedham to ‘die’ (or rather not die) in his house. Our own research told us that James Sturdy was in fact Clara’s uncle. In 1833, the Sturdys had one hell of a year of it! Research is slightly easier these days, with so many genealogy resources online. With that, plus visits to the Borthwick Insitute, we were able to fill in a few of the missing pieces of Hannah’s jigsaw. The Beedhams first crop up in York in the records of St John’s Ousebridge, Micklegate in the centre of York. This church was deconsecrated in the 20thC. Ouse Bridge was at one time covered in buildings – in medieval times there were 36 shops on it, and 5 tenements. The Whitterons appear to have come to York maybe pursuing their business of being watermen , as when John Beedham was six years old, his uncle, John Whitteron, also a mariner, married at Ousebridge. There seem to be a number of unrecorded little Beedhams, because the next recorded birth to William and Elizabeth was in 1802, that of their eighth child. By 1802, William was no longer described as ‘farmer’ but as ‘joiner’. The Beedhams seem to have gone into carpentry – William and later his sons, William and John, both turn up in Trade Directories described as ‘cabinet makers’ . Whoever built a small yard of tenements in a gap site first would have named it after themselves. If he was a Freeman of the City, had once farmed and now was a cabinet maker, there’s no reason why Beedham wouldn’t have owned the place in Skeldergate. As cabinet makers, carpenters and house-builders. Elizabeth could not be down as ‘gentlewoman’ with an ‘un-genteel’ address, which suggests Beedham’s Yard was indeed, not a nest of disease and prostitutes in 1823. A look at Beedham’s Court’s inhabitants twelve years on, in the Census of 1841, suggests otherwise. (And again, these kind of sources are freely available in the age of the internet but back in 1989 when the book about Hannah was being researched, Trade Directories and Censuses were not so readily available). We can now revise our view of Hannah a bit, in the light of this newer information. Finding this, also begged the question of who Elizabeth Beedham ‘gentlewoman’ was? The most likely candidate is Elizabeth Beedham nee Whitteron, Hannah’s grandmother. To get a better sense of Beedham’s Court, we turned to the 1841 Census, where we found 31 households there. Butchers, joiners, cabinet makers, watermen, labourers, mariners, tailors, printers – mainly family groups, not households of single people, and mainly working folk with trades. No doubt the elderly Elizabeth Beedham ‘gentlewoman’ was dead, by the 1841 Census. Both the Beedham lads, William and John, became cabinet makers and joiners themselves and the parish records take up the story, again. In 1808, aged 22, John now a joiner himself, married Ann Simison, also of St John’s parish. John was literate enough to sign the register, but Ann signed with a mark – not uncommon at this date as working class men often received some sort of a rudimentary education – moreso than women. Only two months after the married, two days before christmas, 1808, their first child Elizabeth was born and baptised the same day. Often a birth and baptism on the same day suggests the baby was weak, and not expected to live which indeed was the case as on the 2nd January 1809, only one week old, little Elizabeth was buried. In July 1810, John and Ann had a son, James. Hannah was John and Ann’s eldest surviving daughter, baptised on 18th April, 1814. John and Ann’s address is given as Skeldergate which could well mean Hannah was born in Beedham’s Court. We have no baptismal record for this child for either of the Beedham brothers – again not uncommon for this date, especially for girls – and we are still pre civil registration. The baby buried the day Hannah was baptised must have been Hannah’s sister or cousin, as John Beedham’s brother, William and his wife were also having children at this time and their address is also given as Skeldergate. Either way, it may give us some insight into why Hannah grew up to be such a remarkable character – baptised the same day her sister/cousin was buried – and presumably the much loved replacement of an older daughter who had died in infancy. Hannah was possibly the focus of much attention in the Beedham household, and grew up feeling ‘special’ in some way. Her remarkable start in life might have been a familiar family story, something that she grew up with and that marked her out. A year after Hannah was born, she had a sister, Elizabeth, and two years after that, in 1817, she had a brother, Thomas. In 1819, there is recorded the burial of an Ann Beedham, aged 42 years – but we cannot know whether this is John Beedham’s wife, Ann or William Beedham’s wife – also Ann. John’s brother William was buried at St John’s in 1823, aged 37 years and at this point, no more Beedhams are recorded in St John’s parish records. Muldowney and Cade make the point that York in the 1820s and 30s, would have been home to various of the Millenarian sects, like the Soutcottians and Wroeites of ‘Wroes’ Virgins’ fame. These people had their roots in the 17thC Fifth Monarchy movement, which preached that there was to be a second coming of Christ. They often preached a brand of hell-fire and brimstone; some had charismatic leaders. If Hannah came across the story of Johanna Southcott, she must have figured that she could gain notoriety by dying on cue – the same way Southcott became famous for claiming to be about to give birth to Shiloh (the Second Coming) – when she was in her 60s! Certainly, there does seem some possible manipulation of the press, as Hannah appears to have told of scenes around her much like those described by early spiritualists of twenty years later – various happenings we’d now equate with ‘psychic phenomena’ – things flying around the room, strange nosies, etc, which many 20thC psychologists believed had more to do with female girls and puberty, than the supernatural. The press seem to have got hold of a story that Hannah lay in a hospital bed at the county hospital (first misreported as the Easingwold Hospital), when she had her first visitation from god in 1831. Chris Cade feels one reason the press did latch on to Hannah was the fact she might have correctly prophesied some kind of epidemic and in 1832, right in the heart of the Bedern where Hannah is known to have lived, a waterman named Thomas Hughes was the first York person to succumb to cholera. He had brought a boatload of disreputables across the river to the York Races, and the newspapers pointedly remarked they were from Selby and Hull, where cholera had taken hold. Hannah gained believers and followers because some time pre the summer of 1832, she ‘foretold’ an epidemic. The York Courant of the week after the-death-that-never-was, in 1833, refers to “ravings”, also “trances, predictions and street preachings”. Her precise predictions (apart from the one that she was going to die on 1st August, 1833) are not known. And we have no idea of which sect she belonged to – although the papers make reference to her having her ‘ticket withdrawn’ by the Methodist chapel. ‘Some gentleman’ was in fact, my relative, James Sturdy. We know there were Beedhams in Easingwold – and she may have visited there in the past and used it as the first place that came to mind to explain an absence from home… Certainly when cholera broke out in June, she may well have escaped to Easingwold relatives, as the scenes unfolding in York were truly apocalyptic. Times, places and dates are always elusive, in this story. The August 1833 newspapers mention that she was in York County Hospital three YEARS earlier when she claimed to have had her first vision (which would make her 17 when the delusion/attention seeking scam/whatever it was started). But that they’d reported Easingwold County Hospital in error. Certainly there is some garbled story around Easingwold, that we can’t really untangle at this distance in time. We must now visit William White, Hannah’s future husband, to get a fuller sense of the story. We have yet to track down the precise William White that Hannah married! A William White was baptised at Stillingfleet 20.2.1814, son of prosperous George White, ‘gardener’ and his wife, Mary. George’s property in Kelfield is shown on the 1830’s tithe map. George White seems to have been comparable in status to James Sturdy, his fellow Kelfield gardener/farmer, being substantial enough to pay tithes. Many a yeoman farmer’s son is down in parish records as ‘labourer’ as technically, labouring on their family farms that was what they were. William White’s status as farm labourer and later slide down into poverty may not reflect his true status, at the point he met Hannah. 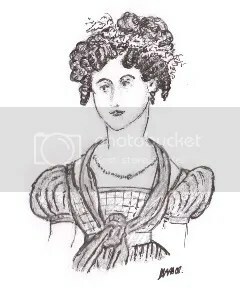 We should recall that at the height of her fame, being written about not only in the York papers but also the nationals, and having enough impact to fill Kelfield in the summer of 1833 with over two thousand people – Hannah White was still just a nineteen year old. It’s a salutary thought that both William White and Hannah Beedham were virtually the same age as the parish’s teenage church singers when they drowned six months later. The singers may well have been to school (or Sunday school?) with White. 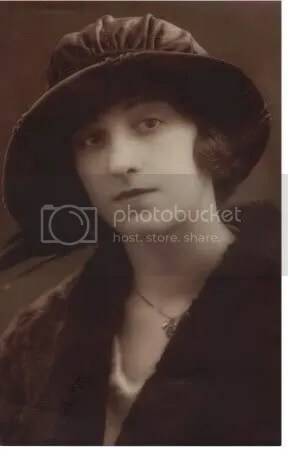 Clara Sturdy of course had even more reason to know White and maybe Hannah also as she spent three weeks/months in Clara’s cousins’ home in Kelfield. William White is quite a mysterious figure but we do know he was literate enough to sign his name on his wedding to Hannah, and so it is likely to have been educated at the Kelfield village school, which was close to his home. When the cholera scourged York in 1832, it would have made it all the less remarkable that Hannah stayed away for some of that year,’with relatives in the country’. Back from Easingwold, Hannah seems to have been in York again by early 1833, and then, three months – or three weeks – before the ‘death’, at the Sturdy’s house in Kelfield. With much less to go on, as they were working pre-interwebs, Muldowney and Cade and others since, have assumed Hannah maybe met White at this stage, in those ‘final’ weeks leading upto the ‘death that never was’ in Kelfield. Muldowney and Cade comment on the paucity of evidence – either in the Methodist records, or contemporary Anglican accounts of the time – bearing in mind Sir Clements Markham’s unpublished history of the parish covered this period and yet no mention, once, of Hannah. The most newsworthy story the parish ever saw – until that night four months later, when the tragedy overshadowed all. It is possible that the establishmen, both methodist and anglican – Markham’s father was the parish vicar – simply didn’t think it worth a mention – a young woman, little more than a teenager, with radical views. It certainly looks like a ‘silly season’ press story, now – with the press being cynical and gleeful and suggesting most of the two thousand rubberneckers at the death-that-never-was, were there for a bit of fun. Hannah may have been delusional, and in that sense, sincere. She was gaining notoriety for preaching. John Wesley had had no problem with females preaching but with his death, the methodist movement became more conservative and by this date, Hannah would have been an embarrassment for those who wanted to move on – leaving women back in the congregation, not leading it. All this affects the way contemporaries viewed her. An upstart female preacher turned prophet – technically blasphemous. Yet the seem to have viewed the whole thing as a joke. This is the fag-end of Regency England, remember – not Victorian. Sensibilities were more robust. We tend to think of all 19thC people as ‘Victorian’ – but in 1833, the world view was a little bit more cynical, rude and rollicking than that! We cannot know whether William White was present or not, during the death that never was. The Sturdys are an old Cawood family, who crossed the river to Kelfield and Stillingfleet parish around the same time as my family, the Fishers. 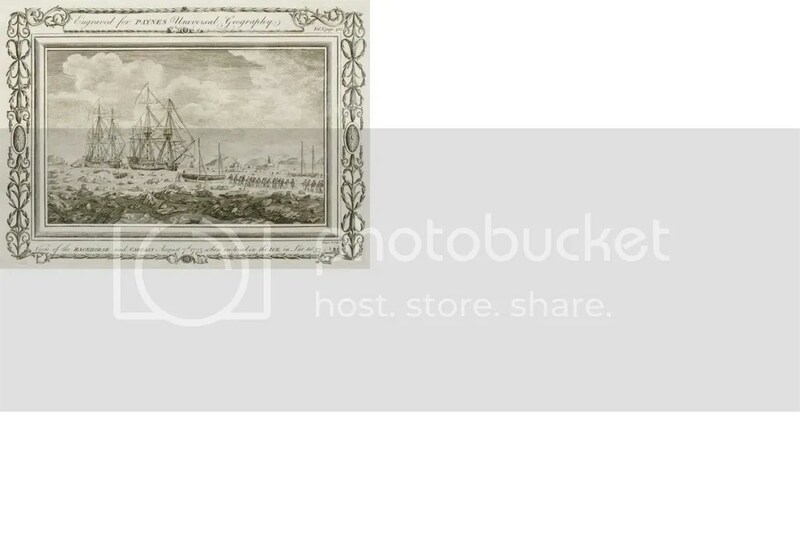 In the early 18thC, in Cawood, the Sturdys – then ‘Stordys’, married into a family called the Mulkeys – also my ancestors – so we’re indirectly related to James Sturdy. James Sturdy must have gone over to the Methodists by 1833. Whether his association with Hannah lost him his ticket, we don’t know. Although the Times refers to him as ‘gentleman’, that may be a little tongue in cheek. He was usually described as a ‘gardener’ and his land comprised of a garth, orchard, probably a house and barn. Detouring to my Kelfield ancestors, It is also possible, my great grandmother X 3 Mary Fisher’s sister, Jane Guy had some involvement in the Kelfield Propetess story. It looks likely Jane and Robert Guy were also Methodists – the new Methodist chapel in 1852, was built on what used to be the Guys’ land. Jane and Robert lived at Auburn Hall, Kelfield (now Manor Farm). 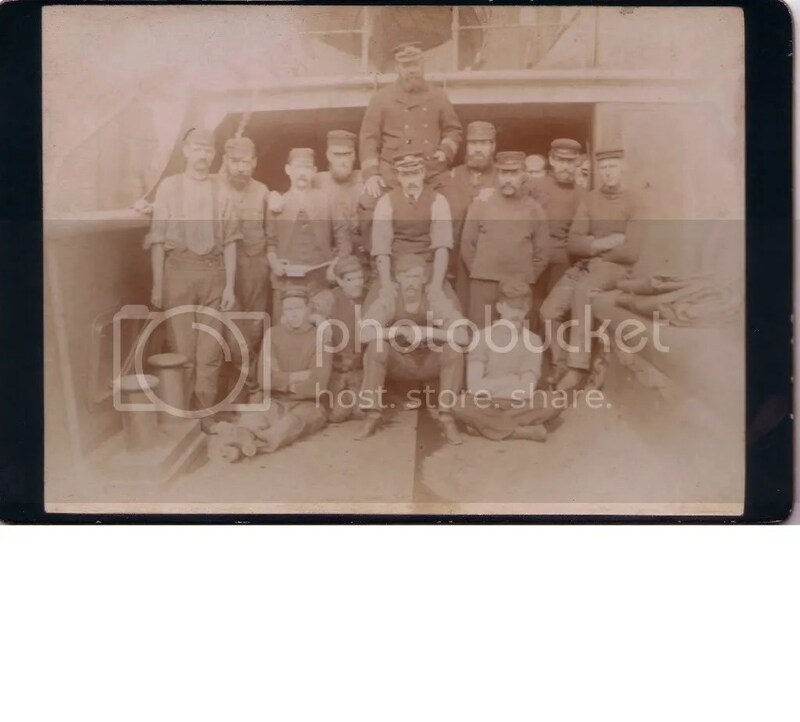 The Guys were an old yeoman farming family from Bubwith, who moved to Kelfield in the 1790s. They lived at Auburn Hall, Barnard Clarkson at Kelfield Manor. Wierdly, Robert Guy is an ancestor of my dad and Jane Guy – of my mum! Robert Guy’s cousin, Barnard Clarkson, seems to have financed the building of many Methodist chapels in the East Riding, and was a notable lay preacher. Wesley himself preached at Clarkson’s father’s farmhouse in 1794. My family – like the Sturdys – were firmly split down the middle; half church, half chapel. Mary Fisher, my grt X 3 grandmother, stayed with the Church of England. It looks likely that her sister Jane, went over to the Methodists. The Sturdys and the Fishers were typical of local families – half going over to the Methodists and half staying with the old church. Locals always say it is interesting that in the 19thC Stillingfleet is described as having ‘people’ or a ‘population’. Kelfield, on the other hand, is a village of ‘souls’. By 1852, the tiny village was served by two Methodist chapels, only a minute’s walk apart. It was thought there were upwards of two thousand visitors camped out in Kelfield, at the height of things, and coaches returning to York from the village were mobbed by people anxious for the news from Kelfield. People came from as far away as South Yorkshire, and the newspapers mentioned juries ending cases hurridly so they could rush to Kelfield. The farmers’ fields were ruined by all the trampling across them, and the visitors camping in the fields around. Waiting for Hannah to die. I’d imagine the Kelfield farmers must have hated James Sturdy right then! Apparently the ferryman at Cawood did a roaring trade, ferrying rubberneckers across the river to Kelfield. Kelfield Chapel: On August 1st, 1833 - they did the catering! The story of what happened on August 1st, 1833 is told by The Yorkshire Gazette, two days later, here. Which tells us Hannah spent around twelve days after the ‘death’ still at Sturdy’s house, presumably. I can imagine James’ embarrassment must have been acute. For days the faithful (and not so faithful) had filed through his farm-house, to visit Hannah’s great lying in state. When god and the angels failed to swoop – he must have been left wondering how quickly he could decently get Hannah back to York and out of his home. The story is taken into its final chapter, in the records, with the next York parish I could find the Beedhams in the records – Goodramgate. This is the small church almost opposite the Bedern, where we know Hannah seems to have spent her married life. On 29th December, 1835, two years after the ill fated ‘death’, William and Hannah married. At their wedding at Goodramgate, he signed the register and Hannah marked. Remarkable that a woman who couldn’t even sign her own name must have been an orator, enough to take some thousands want to travel the length of Yorkshire to see her. Hannah’s father was witness at her wedding which suggests her York family didn’t give up on her, either. William and Hannah’s marriage was only to last four years and the baptismal records for Hannah’s children, Elizabeth and Ann, show the girls to have been baptised at the Bedern Chapel, just across the way from Holy Trinity. The Bedern Chapel was part of the church. Hannah may have had her ticket to Methodist chapels withdrawn, but she seems to have continued with the anglican church. There is a record of Hannah’s burial on Christmas Eve, 1839, aged only 27 years, at Holy Trinity, Goodramgate. On that christmas eve, only six years on from the death that never was and almost exactly the anniversary of the Stillingfleet Tragedy, a lot of Kelfield and Stillingfleet families must have been considering their lost loved ones, especially those girls born in the Regency years – like Hannah. It is easy to forget how young she was. A couple of local papers carried a brief, laconic notice of her death – six years on, the Prophetess of Kelfield was still remembered. After Hannah’s death, William seems to have drifted to York and ended up a ‘labourer’. The Whites were neighbours of James Sturdy in Kelfield. Possibly, returning to Kelfield and his own family was untenable for William White after the events of the summer of 1833. In the 1841 Census, William could be found still in the Bedern – York’s most notorious slum – in a multi-occupier building, listed as ‘labourer’. His child/children with Hannah nowhere to be found. By the 1851 Census, William disappeared into obscurity. It’s possible he disappeared into the anonymity of Leeds or London, and more than possible he ended his days in the workhouse. It’s impossible to decide whether she was deluded, or someone who set about manipulating others, for attention or some obscurer motive. The York press made their scepticism pretty plain, referring to her with terms like “imposture” spouting “rhapsodies” and call her a “fanatic”; also making reference to her “limited intellect”. They imply that the whole Nine Days’ Wonder, where thousands of people descended on Kelfield was probably for most, just a bit of a jolly – no-one seems to have taken her all that seriously. Maybe the press have always had their summer ‘silly season’ and Hannah just fitted perfectly into that mould, as silly season fodder. I do think we can revise our view of her as impoverished – the Beedhams clearly had more substance than we’d previously thought. Certainly the whole incident, would have confirmed for some of our fourteen on the boat on the Ouse, that they had made the right choice, not going over to the ‘mad’ Methodists. At this time, the hottest debate of the day was whether to give non conformists the vote – and many of the same newspapers reporting the Beedham incident were also at pains to argue the corner of Methodist farmers like Sturdy who were still compelled to pay the anglican church tithe – without wanting to set foot in the anglican church – a growing cause of friction in places like Kelfield. 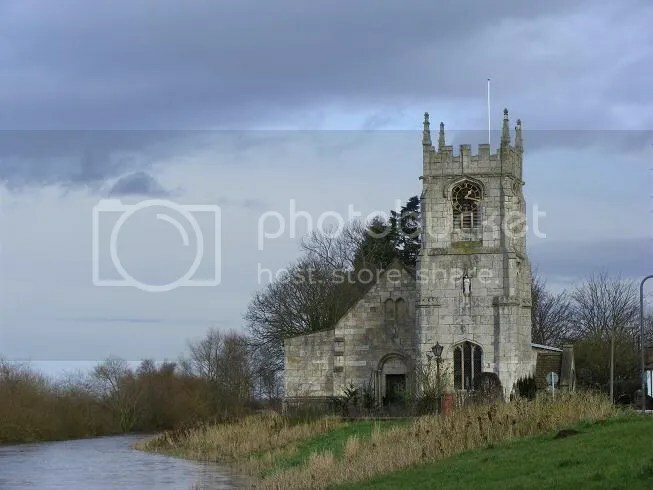 Taking her place with the Stillingfleet Church Singers, Sturdy’s niece Clara must have felt a little bit more secure from ridicule, as that little boat pulled oat across the Ouse, that night in December, 1833. Brown got 6 months’ hard labour at York Castle! This was months on from the death-that-never-was and Hannah was back in York and now living in poverty. It must have been surreal to know her waxwork was on display in the city, next to the Queen’s! Either way, a curious postscript to an even more curious tale.